Our St. John’s Square showroom is right in the middle of all the action and always brings the crowds. It’s a fabulous old townhouse full of character and so different to most of the showrooms around here. 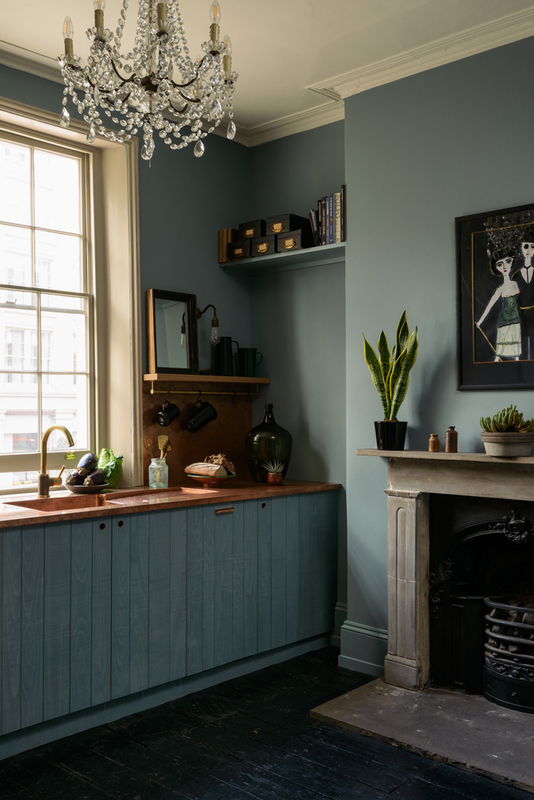 It’s kind of like having a nosy around someone’s home full of little corners of inspiration: charming wall colours, quirky antique cupboards, cool books, handmade ceramics and of course a couple of pretty special kitchen displays. 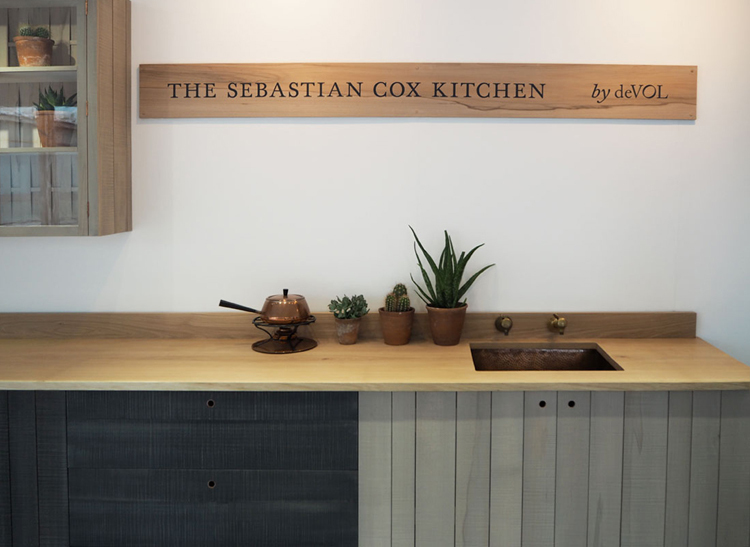 This year we had a brand new Sebastian Cox Kitchen to show everyone up on the first floor. 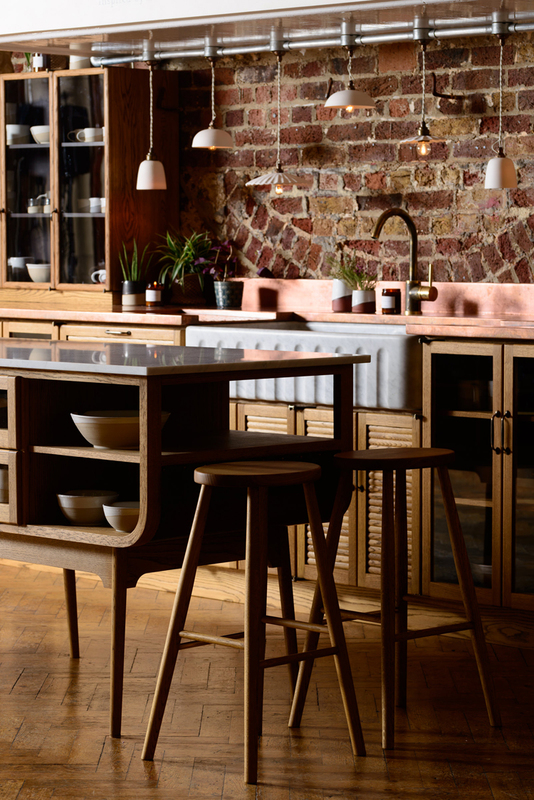 We actually launched the Sebastian Cox Kitchen at our first Clerkenwell Design Week back in 2015. We were in the ‘Detail’ exhibition, which at the time was a little tent in St. John’s Square, our stand was 6 x 2 m – just a couple of cupboards and a big pantry. How cool to see this kitchen three years on, pride of place in the landmark corner building on the same square! The glamorous St. John’s display shows how far this range has come, a true testament to how these rustic cupboards continue to surprise and delight us with how perfectly they seem to fit in every home, no matter the style, age or size! The star of the show was definitely the aged copper worktop with integrated sink and impressive splashback. 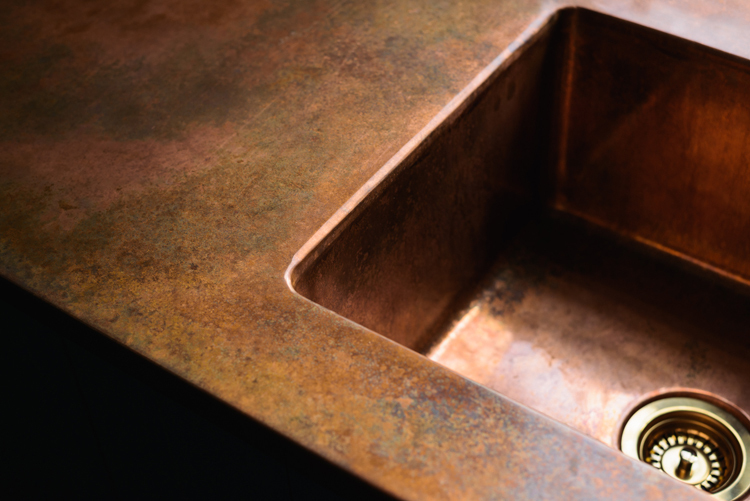 Everyone loved the wonderful patina and how the worktop seamlessly flowed into the draining board and the sink. 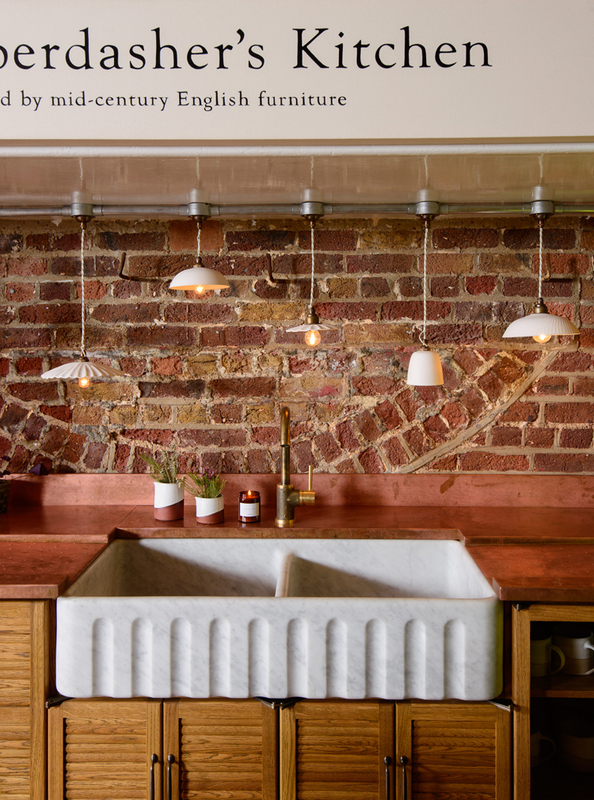 True, it’s a lot of copper but the mottled pattern of the aged metal softens the look meaning it’s more ‘could have been here forever’ than ‘shiny new kitchen’ and it adds a little sparkle a small, moody room. 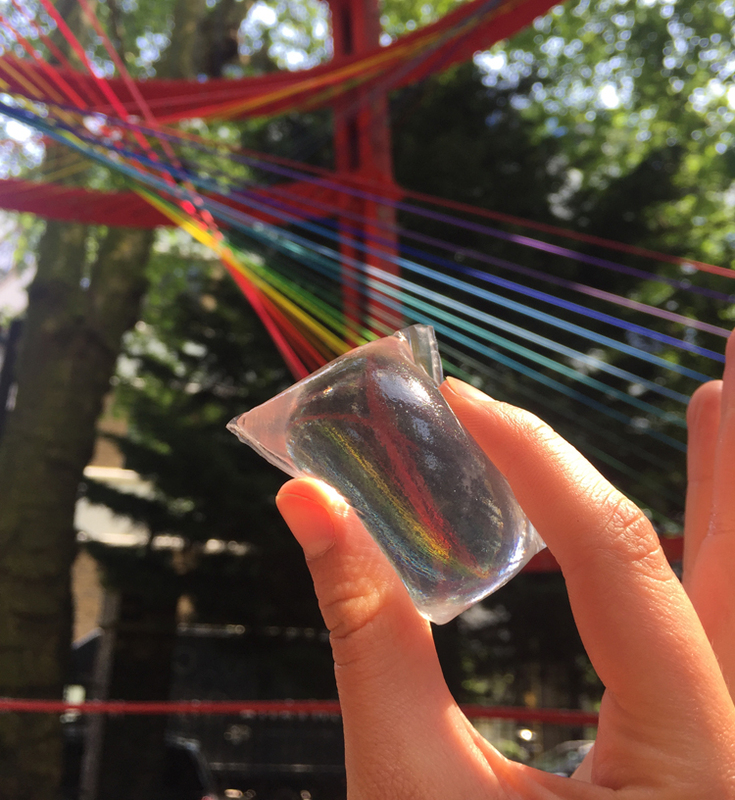 The luckiest people visited in what I call ‘the magic hour’ – sometime in the late afternoon when the sun is at just the right height to stream through the sash window and hit the copper, giving the room the most beautiful warm glow… it is totally enchanting! But it wasn’t just a new display that we had to show off this year… we had a whole new kitchen range to launch, The Haberdasher’s Kitchen – a redesign of our modern retro Air Kitchen. It’s always pretty nerve-racking unveiling something new, especially when you know how hard so many people have worked and when it’s such a different look for deVOL. We are known for painted kitchens, but this time we decided to use a gorgeous stained oak – far too gorgeous to cover up with paint. It was a bold move but one that felt so right when you consider the inspiration behind the design: mid-century furniture and old haberdashery shops. Paul and the Design Team have been so busy developing this new range that we hadn’t really seen very much before the show, just a little render drawn up by our Creative Design Manager, Huw, and a few videos of mock-up versions on Paul’s Instagram. So walking into the amazing barrel-roofed crypt on Monday morning and seeing the stand all set up was our first real look at these very special cupboards… wow. Similar to the Sebastian Cox Kitchen, it’s definitely something you have to experience in person. I mean, don’t get me wrong the pictures are amazing as always thanks to our incredible photographer Tim, but there is a textural element to this kitchen and an attention to detail that you can only truly appreciate when you run your hand across the cabinets to feel the silkiness of the oak or touch the smooth Carrara marble and cool copper services. When you open the doors and feel how easily they glide and notice the unusual Crittall-style hinge made by hand in our metal studio at Cotes Mill. 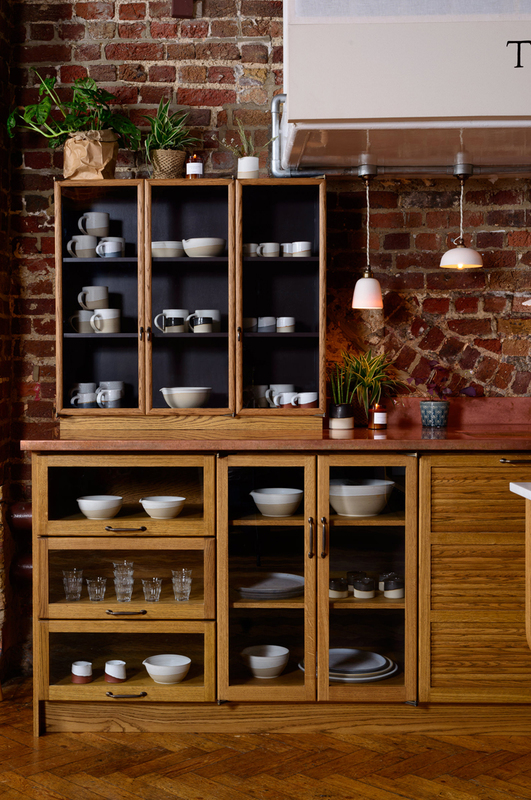 When you realise the small cupboards are not the lift-up cubby holes you remember from the old haberdasheries but elegant glazed draws that look equally as good with a just a couple of deVOL stoneware pots or filled with stacks of glasses and plates. It is a kitchen with real soul and I think that is what everyone at the show fell in love with. I won’t go on too much about the design (you can read all about it here) but I will say that we were overwhelmed by the amazing reaction of the design-savvy crowd. 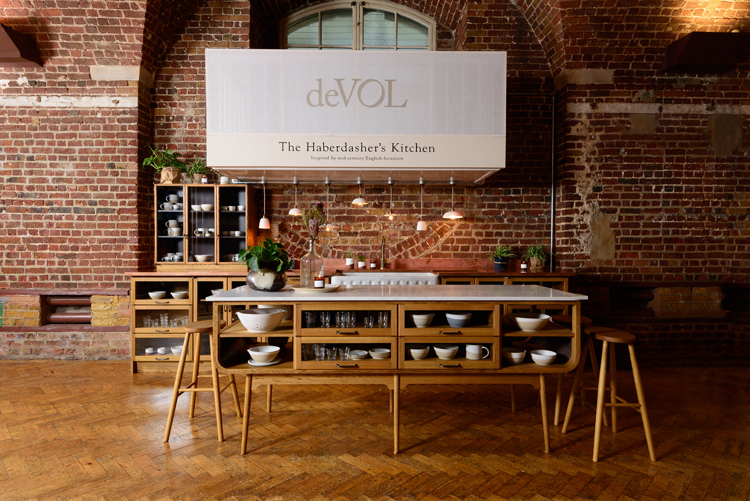 So many deVOL-fans who were wedded to the classic painted English kitchen look were completely won over with this new style. Design guru’s Satori & Scout chose it as their favourite display, whilst Fawn Interiors Studio said they visited the show just to see the new kitchen and it ‘did not disappoint’. 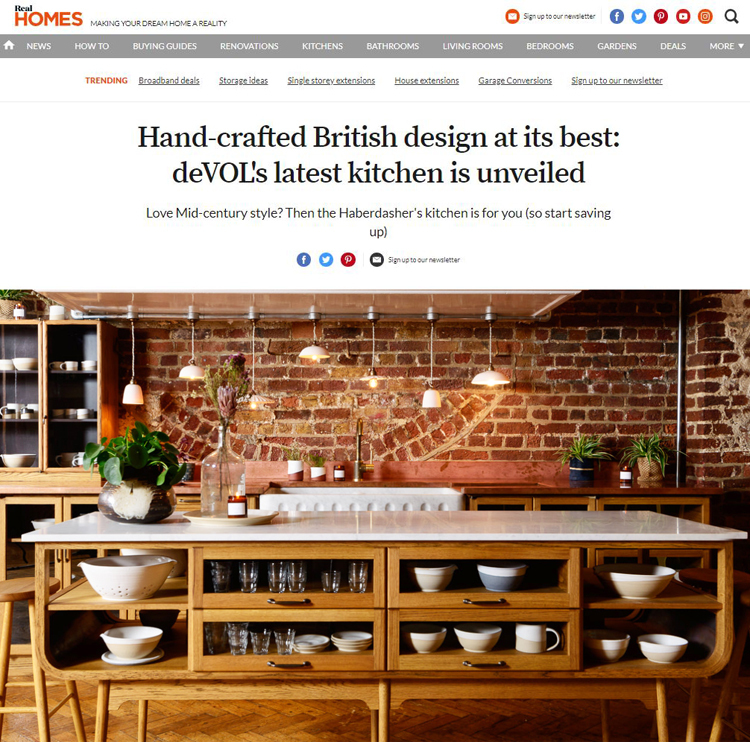 Real Homes were quick off the mark with our first online article calling the new range ‘hand-crafted British design at its best’… not a bad way to kick things off! 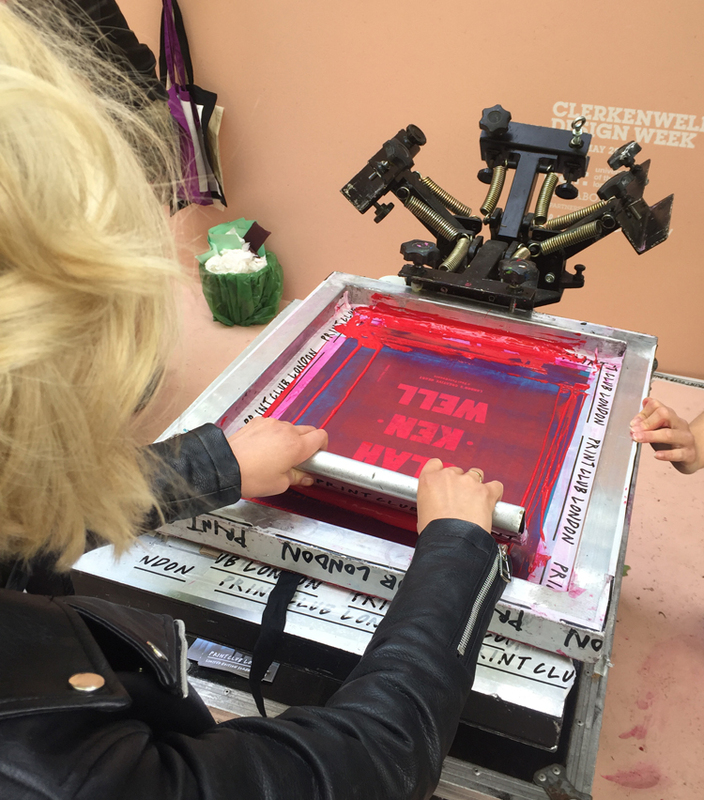 I’m sure we’ll be seeing lots of articles popping up over the next few weeks and months, you can check out all of our favourites on our press page. Hats off to Paul and the team for pulling it off once again, you guys never fail to amaze me. You all deserve a big pat on the back and probably a holiday after the hectic last few months. Now we just need to sort out the display for Cotes Mill so that we can welcome even more people to come and experience this unique beauty… maybe the holiday will have to wait! I also want to say a big thank you to everyone who came to visit us over the three days, your lovely comments really do make all the hard work worth it. Plus having countless people tell me how lucky I am to work in such a fantastic office with a bunch of really lovely, passionate people was a nice reminder of how great my job is. 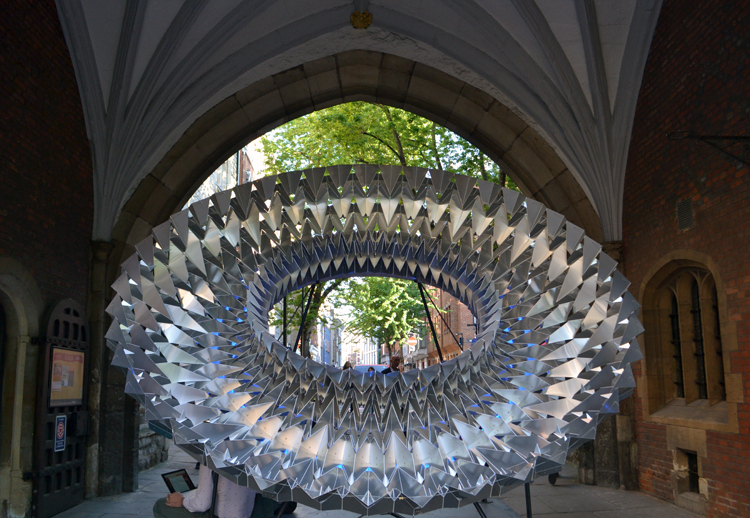 Make sure you check out part two to explore the Chelsea Flower Show and take a look at the new “elemental” kitchen… coming very soon!